We are the problem and the solution! Our beaches and coastlines are undeniably being invaded with a tide of plastic, lets face it the scale of the marine plastic crisis is pretty daunting with a rubbish truck finding its way to the ocean every minute. How can an individual or one company such as Surfdome solve this issue? Its not something we can do alone … but we must do something right? 2MinuteBeachClean doesn’t ask you to clean the whole beach, it doesn’t make you feel guilty for not being able to make every organised beach clean or for that matter solve the entire crisis. 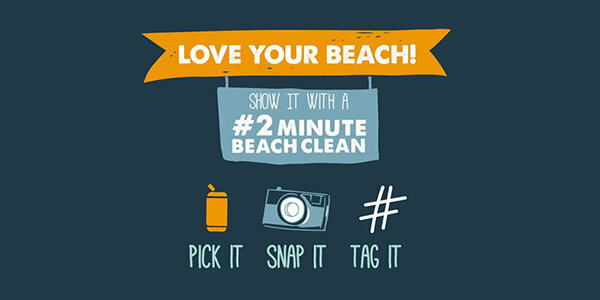 It simply says “do what you can’ 2 minutes on every trip to the beach or in fact anywhere, just pick up a few pieces. Every single piece we pick up maters, that piece won’t go on to strangle a seabird, kill a turtle that eats it, become a toxic mass and work its way up the food chain or coat the ocean floor and prevent new life from forming.We really do have that much power and ability to make that much difference in … only 2 minutes! That’s why we at Surfdome have been #2MinuteBeachCleans key supporter from day one, from the very beginning of Martin and the rest of the #2MinuteBeachClean teams journey. We help in many different ways (too many to list) from helping with the beach boards which have achieved a 61% reduction in marine litter on one beach alone and are now on over 400 beaches around the UK and Ireland, to putting the logo on all our recycled and biodegradable packaging to spread the word. And we couldn’t be prouder to do so! Read on to learn more about how the movement that is changing beach culture! We all have 2 minutes …. Right? 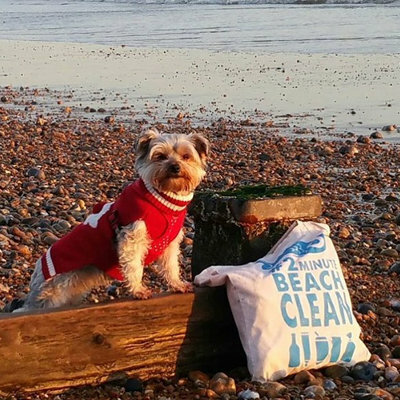 What is the 2 Minute Beach Clean? 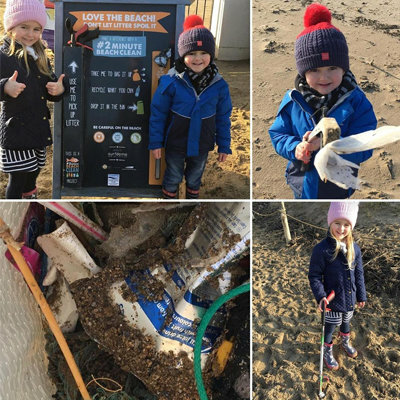 #2MinuteBeachClean are a growing family of beach lovers rolling up their sleeves to help rid the world’s beaches of marine litter and plastic pollution, two minutes at a time. 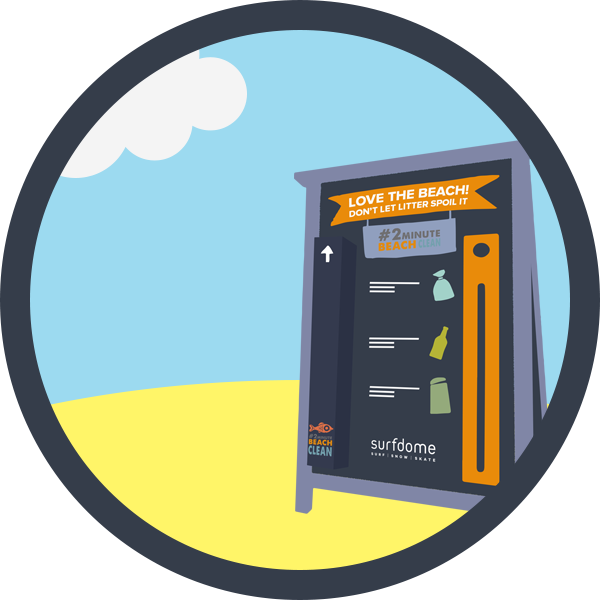 Surfdome and #2MinuteBeachClean believe that every piece of litter removed from the beach matters. So it doesn’t matter if you do 2 minutes or 30. Each and every piece of marine plastic removed from the beach is a piece that will no longer go on to kill. Everyone has 2 minutes. 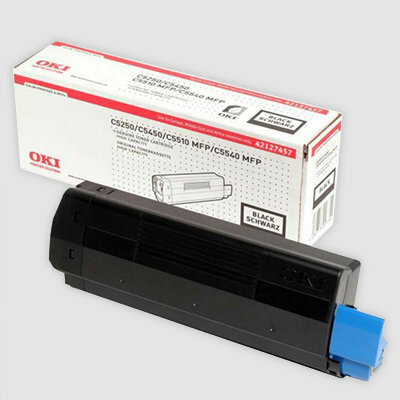 You’ll be surprised what a difference it can make. 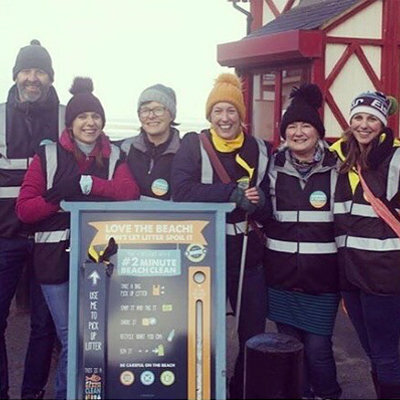 The idea of the beach clean station was conceived in Bude in 2014 by Kim Stevens and Deb Rosser as a way of making it easier for everyone to do their bit. We at Surfdome, with the help of Beach Care, helped fund the first beach clean station at Crooklets Beach in September 2015. 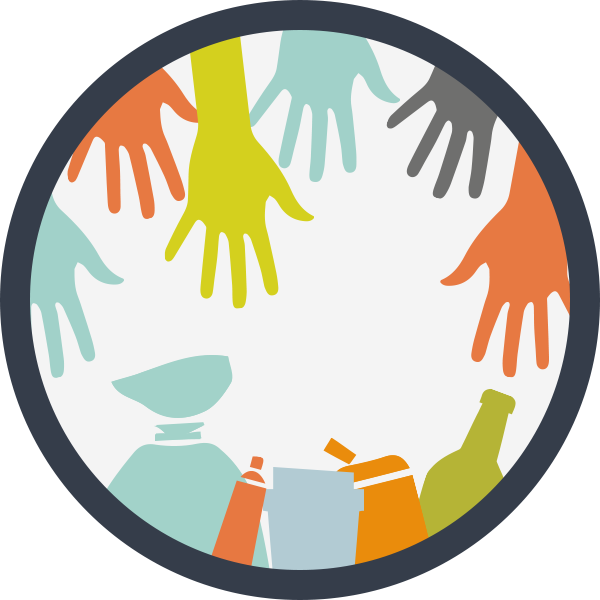 By September 2015, the amount of litter collected on monthly clean ups was reduced by 61% compared with the same period in the year previously. 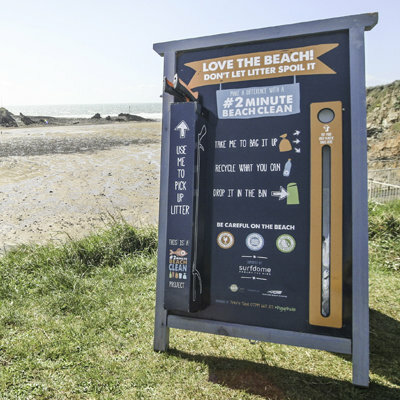 Since then over 250 beach clean boards have been sent across the UK and Ireland! 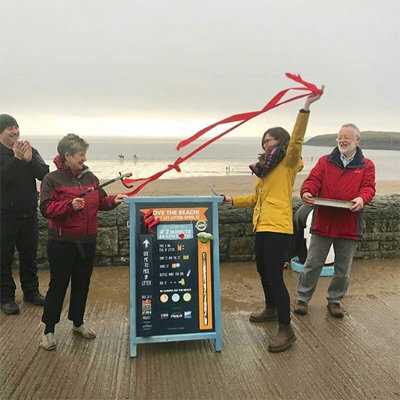 The beach clean stations are A-Frame boards with an outer holder for litter pickers and an integrated holder for carrier bags. Users take a litter picker and a bag, fill it up with litter for 2 minutes or more and dispose of the litter in nearby bins or recycling points. 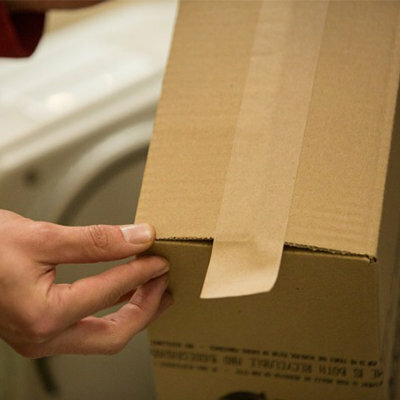 Carrier bags are to be placed back into the holder ready for the next user. Each sign has a chain to stop it from opening and collapsing, a latch to keep it in the right position and can be sandbagged on windy days. 8 million tones of plastic waste find's its way to the ocean every year! How do we fight marine plastic pollution? With knowledge! Once we understand what’s going on in our oceans and identify patterns, we can create solutions. Can a simple mobile phone app help solve the marine litter crisis? We think it can! We are immensely proud to introduce the new #2MinuteBeachClean app! 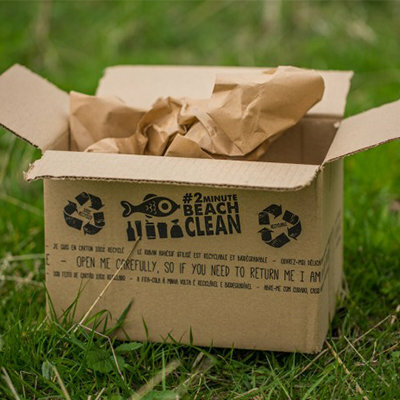 100% of profits go directly to the #2MinuteBeachClean, helping to clean up our beaches. Plastic? No thanks. Around 8 million tonnes of plastic is dumped in our oceans every year, that’s a rubbish truck every minute, and it’s killing our ocean life, making our favourite place a toxic soup of plastic waste. So we have eliminated 14 tonnes of plastic from our operations annually. 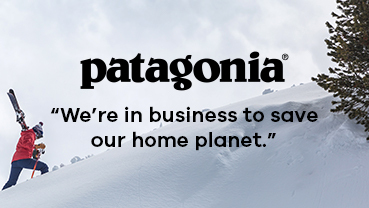 We all love venturing out amongst the oceans, the mountains, the hills, and parks - so naturally we want to look after those special environments. Choosing gear that has a minimal or even positive effect on our playground is a smart choice for our tribe. 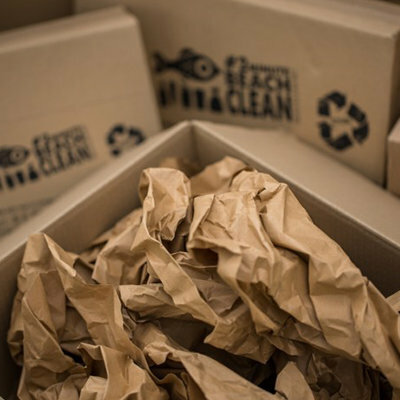 Products listed here will have a variety of sustainable credentials both environmentally and socially and have all been independently recommended by the Sustainable Surf team. As an avid surfer and beach lover, Martin Dorey has become increasingly alarmed at the state of our coastlines where large amounts of marine litter are washed up on a daily basis. In a passionate talk, he shows us what is possible when we just devote 2 minutes of our time to actually do something against this issue. Martin Dorey, our Founder, is available for talks and lectures, beach cleans and school visits. He is a TEDeX speaker and has spoken at lots of conferences and events, including The Blue Flag Nations Conference in Holland, The Festival of Hope at The Eden project, The Cleans Coasts Awards in Dublin, The Bude Wave Conference, TEDeX Kiel University and the Tom Talks at Bournemouth University. He has also spoken at primary and secondary schools around the West Country and led and inspired beach clean projects, including our first record–breaking mass #2minutebeachclean with 290 students from Bideford College. Surfdome © 2019. Todos os direitos reservados.